DiAnne and her son Jacob. Out of all of the theories that I have learned in my academic social work career, I find myself most drawn to theories described in phases and stages. For me, they are easier to remember and often clearly lay out how individuals can evolve over time. Theories and models don't describe everyone, but they're important to learn as a basis of understanding people and the challenges that they face. A few years back, I was delighted to stumble upon an article that contained a phase theory for adult adoptees. 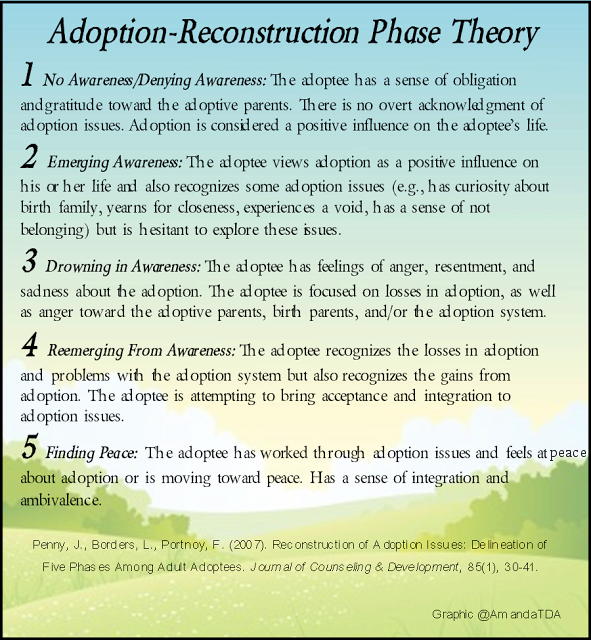 Written by L. DiAnne Borders, Judy Penny and Francie Portnoy, it was titled Reconstruction of Adoption Issues: Delineation of Five Phases Among Adult Adoptees and published in 2007 in the Journal Of Counseling & Development. The article described how feedback from a previous research project, where adoptees had responded in-depth about their narratives, prompted the researchers to investigate how adoptees reconstruct adoption. After conducting research from a sample of 100 adult adoptees, the researchers had developed five (non-sequential) phases of adoption-reconstruction. The five phases resonated with me personally and were meaningful to every adult adoptee that I shared them with. Because life is just too short not to engage in dialogue with other professionals and individuals knowledgeable about my topics of passion (like the time I missed being able to extensively dialogue with Dr. Betty Jean Lifton because I hadn't the foggiest idea who she was at the time that she emailed me), I reached out to Dr. L. DiAnne Borders who was listed as the contact person on the 5 Phases article. She graciously agreed to let me publish the questions I asked her here. Dr. L. DiAnne Borders is Burlington Industries Excellence Professor in the Department of Counseling and Educational Development at The University of North Carolina at Greensboro. 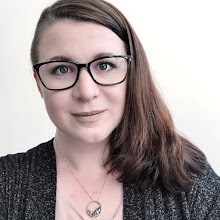 She received her BA in English education at The University of North Carolina at Greensboro, her MAEd in Counseling at Wake Forest University, and her PhD in Counselor Education and Supervision at the University of Florida. She is well published in the professional world and has held numerous titles and awards. I found the way you came about conducting this particular study fascinating. Can you explain to my readers what happened? That was all Francie Portnoy. She is an adult adoptee and she was working with a number of adult adoptees at the time and saw the need for research since she could not find information to help her understand her clients’ (nor her own) experiences. She reached out to me and Judy Penny and we started meeting over lunch to listen to her talk about her experiences and questions; I looked at the research literature and found the gap there also; and we continued to meet and design the survey and study…and then finally did it! I’m not sure I can answer this question. I am not an “insider” in the adoption community, especially adoptees. I do have a sense, from research and counseling experience and parenting, that “adopted” can become the explanation for teachers, counselors, and others for whatever the problematic issue is. This is similar to how teachers, counselors, and others can “blame” the parents’ divorce (“broken home”) for a child’s misbehavior in the classroom, for example. If something is not going right/well with the child who was adopted, it must be because the child was adopted. Often, the explanation instead could be that the child was not adopted earlier…or something totally unrelated. Do you feel like all of the phases should be seen as a “normal” part of the adoptee experience as well? That’s my gut feeling, yes, and that they may be re-experienced at various points in one’s life. However, I do not have any empirical evidence for that gut feeling. The 5 phases remind me a lot of the stages of change: (1) oblivious a change in your life is needed, (2) emerging on realizing the need for change, (3) planning to make change, (4) acting to make change, and finally (5) “maintenance or relapse.” Phase 5 of your theory embodies wisdom, the balance of knowledge of loss but dedication to personal inner peace. An adoptee friend of mine wants me to ask, do you think an adoptee identifying as phase 5 but feeling moments of overwhelming sadness or even anger indicates a relapse to a previous stage or if it is part of maintaining at phase 5? What a fascinating observation about the parallels of the reconstruction phases and the stages of change (which are central to a counselor’s work)! My gut feeling (again!) is that phase 5 would necessarily require “maintenance” when one would re-think the journey to phase 5 and be reminded of how he/she got there. Re-occurring moments (or longer) of overwhelming sadness, anger, regret, grief seem natural around a number of life issues – the divorce, loss of a parent, leaving a job, retiring, being adopted. At these times, one is reminded of how they made peace, or partial peace, and moved on and are reminded they can do that again…or find that they need to add something to their coping (e.g., meditation) to regain “maintenance.” The underlying loss around that life issue, whether small or large, might not ever go away totally. From another perspective, one could see all the stages as a way of “coping,” although I do not believe all persons at phase 1 are in denial, as some would assert. And there are some aspects of being adopted that might continue to evoke anger, such as lack of access to records and lack of response from legislators determined not to change closed record policies. Do you feel it is important for mental health providers treating adoptees to determine the adoptee’s phase of reconstructing adoption as a part of assessing and treating them? Not in the diagnosis sense, but to have these in mind as potential explanations…and to ask what the process of considering one’s adoption has been like over time, to explore if the phases apply to the adoptee. In the time since you conducted this research, are there any phases or changes to the existing phases that you would add? No. In re-reading the article, I remembered a lot of our work and discussions and I am still ok with what we found. We haven’t conducted additional work so I don’t have anything research-wise to add. Will you repeat this research with more samples of adult adoptees? There are no plans to do that at this time. Re-reading the articles on the adult adoptees and answering your questions certainly made me thing about it! You are well published in the professional world; several of your articles cover adoption issues. 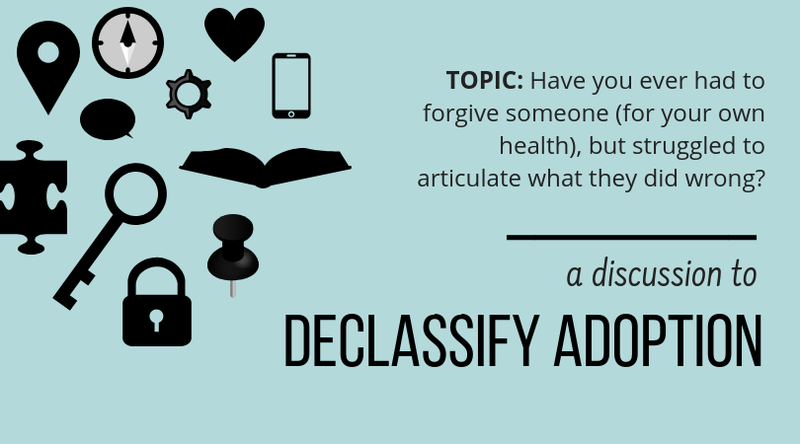 What lead you to research and write about adoption? 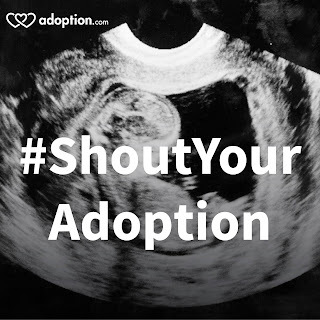 Do you have a personal connection to adoption as well? I am a single adoptive Mom. As an academic (smile! ), I started my journey to adopting by going to the library….what I always do! The information I found there was quite discouraging, essentially saying that my child would be poorly adjusted as a teen and adult (I’m summarizing broadly here). However, the research studies had many limitations. For example, in many of the studies, the adoptees who were studied were in or had been in in-patient facilities, which did not seem like a representative sample to me as they had pretty severe issues that required pretty intense treatment. In the limitations section of the article, the authors would point out that the results should not be generalized applied to all adoptees, but then they proceeded to do just that. As a counselor, I have been trained to look at the potential in persons and to take a strengths-based perspective, so I reacted to these studies and results both as a researcher and as a counselor, as well as a prospective adoptive mother. I wanted to prove them wrong – for the sake of the child I would adopt! I chose international adoption as that was my best option in the early 90s to be able to adopt an infant and I wanted to do the whole diaper and bottle thing; I was 40 so I figured this would be my only adoption/child and my only chance to do those things. After researching a lot of programs and agencies and countries, I applied to adopt from Peru in August 1991, the month my son was born, and got the referral in early January 1992 and shortly thereafter traveled to Lima. The procedure there was that I got physical custody within hours of arriving in the country, so I met his birthmother (and aunt and cousin) at the lawyer’s office; I was able to talk with his birthmother and ask a few questions and take photos; we saw each other several more times while I was there. It was a tumultuous time politically in Peru…long story (there was an ‘auto-coup’; the judges in the courts where the adoption proceedings were being conducted were fired…)…and so I was there almost 9 months to the day. Ironic, yes?! I, and a number of other adoptive parents from the US, spent that time touring museums and taking in lots of cultural and religious festivals in the Lima area. I was fortunate to be living with a great Peruvian family with young school-aged children, which meant I was able to learn even more about my son’s country and culture…and the children shared his toys and time with him. I am so grateful for that time with him…despite the ongoing uncertainty and challenges that were a part of our time there. Jacob is now 21 and a junior at NC State University. He was and is the light of my life. Borders, L. D. (1995). The passing of innocence. Adoptive Families (official magazine of Adoptive Families of America), 28(4), 26-28. Borders, L. D. (1995). "Where's daddy?" Answering your child's questions about single mothers. Adoptive Families (official magazine of Adoptive Families of America), 28(1), 46-48. Borders, L. D. (1995). Waiting to adopt overseas. Adoptive Families (official magazine of Adoptive Families of America), 28(2), 60-61. Borders, L. D. (2010, January). Llamas, heifers, and goats: An adoptive family’s trip to Perú. Adoption Today. Published as a set with “Heifer International” by L. D. Borders and “Proud Peruvian” by Jacob N. Borders.